The reigning champions have been struggling for consistency while the visitors are punching above their weight. After playing a tiring goalless draw in their last I-League match against Kingfisher East Bengal, reigning champions Aizawl FC will hope to get back to their winning ways when they host Neroca FC for the second Northeast Derby of the season at the Rajiv Gandhi Stadium, Aizawl tomorrow (January 20, 2018). 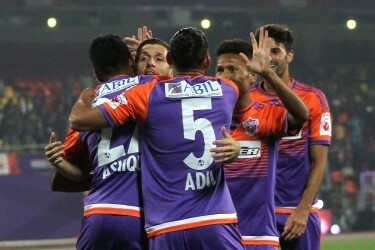 I-League debutants Neroca FC have coped well in their maiden season as they have lost only one match in their nine matches and going into the Derby they will be brimming with confidence as they are coming from an outright win against Indian Arrows but Neroca coach Gift Raikhan is well aware of the threats possessed by the home side. “Every match is difficult and I cannot predict the result. All I can guarantee is we will give our absolute best. Aizawl FC is a very good team and it will be a tough match”, said Neroca FC coach Gift Raikhan on the eve of the match. “It’s been a hectic schedule for us and we cannot properly train in the away matches due to lack of facilities. Some fans are coming from Imphal and I hope it will be an exciting match,” added Raikhan, the youngest coach in the I-League. Aizawl FC can’t afford to lose any more points at home as away fixtures are coming thick and fast. The Mizoram-based side won’t be getting the services from the Afghan defender Masih Saighani but head coach Paulo Menezes said that won’t deviate him from eyeing all three points tomorrow. 2017-18 European Winter Transfer Window Roundup: Sanchez, Ozil, Auba and more! Nigerian defender Kareem Omolaja Nurain has started every I-League match this season for the Reds and his role will be crucial in their quest to halt Neroca’s unbeaten run in the absence of Saighani. Kareem who played for Minerva Punjab FC last season stated that the fans are a crucial factor in the way the team plays their football. “I am very happy to play for Aizawl FC. We are happy to see the fans supporting us and it is easier to perform well with the backing of the fans. Football is a team sport and the fans make it easier to play.” he said. The match will kick start at 02:00 pm and it’ll be telecast live on Star Sports 2/2 HD and will be streamed live on Hotstar and Jio TV.